On the morning of June 3rd, 2008, my brother Billy and I drove away from our house in Staten Island headed towards Chicago. My car, a 2003 blue Buick Rendezvous, contained as many of my belongings as I could squeeze into it plus suitcases, sleeping bags, a tent, and a huge box of snacks for our planned 10-day roadtrip across America that would end at her southwestern edge in San Diego. Almost exactly 12 hours later, we were in Chicago driving on the highway past US Cellular field where we could see the stadium's lights on as a game between the White Sox and Royals was about to begin. "Real quick: should we go?" I asked. He hesitated for a minute. "Yes." I missed the exit and we kept on going. We skipped the game because, upon further consideration, we needed to eat dinner and get settled with a place to stay for the night and a three hour baseball game would leave us tired, hungry, and scrambling for a hotel at 10 PM in an unfamiliar city. We already had plans to fulfill our foreign city baseball fix the next day in Milwaukee. After dinner at a restaurant only a block or two away from Wrigley Field (which was quiet while the Cubs were getting ready to play over in, you guessed it, San Diego) we settled into a cheap, dirty hotel just north of Chicago and flipped between the Cubs-Padres game and the movie "Money Train" on television while we went to sleep. The next morning we were back on the road heading up Interstate-94 through rain and thick fog to Milwaukee. We arrived at the stadium very early and cruised around the premises a bit, admiring the beautiful building from the outside. After a quick breakfast at Perkins a mile away, we were settled into our seats just 10 or 12 rows behind home plate. They'd cost us only $40 a piece and we sat between two elderly couples for a Wednesday afternoon tilt between the hometown Brew Crew and the Arizona Diamondbacks. When we had sat down the old woman to my right had her chubby arm completely in my seat space and she made no effort to remove it once I was there. As the Brewers took their warm-up tosses I considered the prospect of having to spend the entire game leaning to my left so as not to be touching this woman's arm that was invading my $40 seat. I battled within myself. She's an old lady and she's a bit too wide for her seat, give her a break. No! I paid 40 bucks for this seat, I should be entitled to enjoy it and not concede part of it to this inconsiderate bleep! Am I gonna say something... What do I say? Dammit, this is the first day of my true adulthood and being out on my own, am I gonna remain timid and quiet when people are taking advantage of me? No! "Excuse me, can you keep your arm in your space please? Thanks." She looked at me wide-eyed, shocked that I was daring enough to call her out for her injustice, then quickly reeled her arm in. And chuckled. I'd passed my first test. 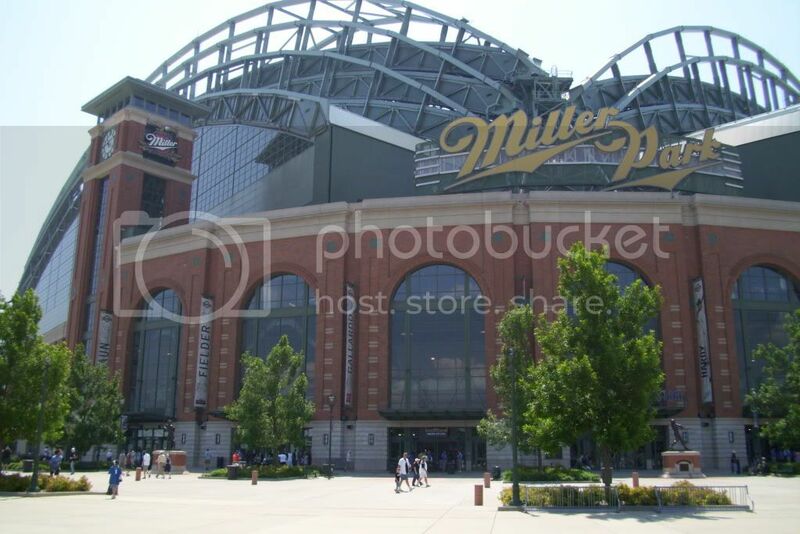 Looking back, the Brewers had seeped their way into my life over the last couple years before I journeyed to their foggy city and spaceship-like stadium. 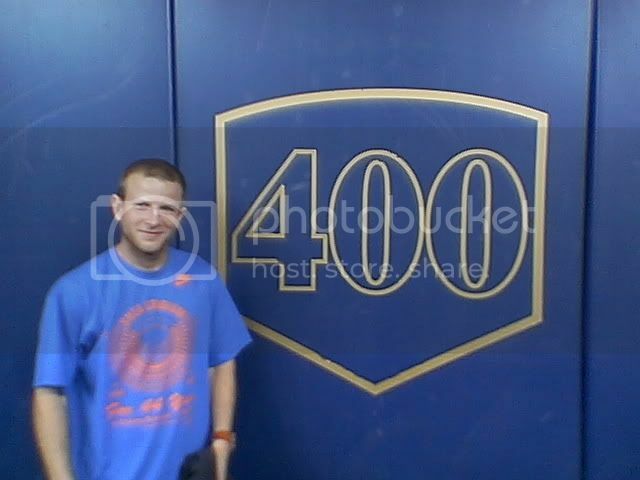 In May of 2006 I joined my brother James and his family for a Saturday afternoon game in Philadelphia against the Brewers. It was a highly entertaining game with lots of offense including a Bill Hall missile of a homerun caught by the guy sitting right next to us in the left field grand stand. Almost exactly two years later I was in Boston for the weekend visiting my cousin Mary and her husband Chris and they brought me to my first ever Red Sox game at Fenway Park, a Sunday afternoon interleague contest against the Brewers. That was also a highly entertaining offensive show featuring 8 homeruns (two apiece by Ryan Braun and David Ortiz), won by the Sox 11-7. 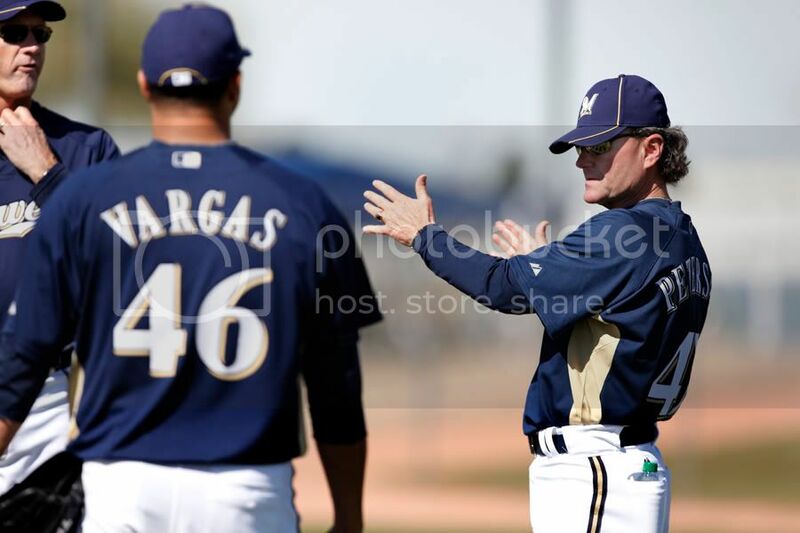 Current Milwaukee manager Ken Macha (right) looks exactly like my dad. 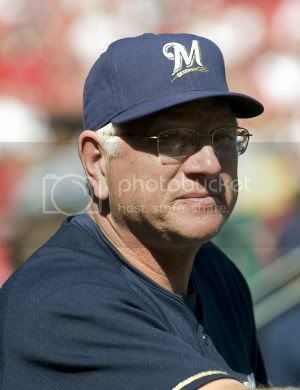 In his first season at the helm last year the Brewers finished with a disappointing 80-82 record, third place in the National League Central. They were favored by many to be a contender for the division title and they were in first place as late as July but they sunk because of an atrocious pitching staff (5.05 runs allowed per game, second worst in the NL) and ended up 11 games out of first. Former Oakland A's and Mets pitching coach Rick Peterson was hired by the Brewers before the current season to work his magic on an unsuccessful group of moundsmen. When Peterson was with the Mets, I remember reading an article about the peculiar mullet-haired pitching coach and how he came to be one of the most sought after pitching gurus in baseball. His dad, Pete Peterson (quite a name) worked in the Pirates front office when Rick was a kid and he got to spend alot of time around the "We Are Family" Pirates growing up. He went to college in Jacksonville and got degrees in psychology and art before spending some time floundering as a pitcher in the low minor leagues. I can't locate the article now or anything that mentions this but I remember it described how he went away to southern California (San Diego, if I remember right) and lived in a tiny studio apartment, studied Zen, practiced yoga and Tai Chi, and didn't work much. That sounded like what I wanted to do with my life and that article played a major role in my decision to leave New York and move to San Diego with no job, no apartment, no plans. Of course, Mr. Peterson went on to become a major league pitching coach and he's noted for using a mix of psychological techniques and Eastern philosophy to lead his hurlers through the long baseball season. "A full season is like crossing an ocean," Peterson says. "It's every day the same guys, same uniforms, same colors, and it's easy to get lost and lose your perspective before you reach the other shore seven months later. Helping people understand where they are along the way and what their recipe for success is, and being there to get them back on track when it slips away is my job." With the full use of both armrests on my $40 seat, I relaxed and soaked in the encapsulated environment we were in, huge glass windows behind centerfield showed it was raining heavily outside. My second indoor baseball game experience (previously saw 2 games at Olympic Stadium in Montreal back in 2002) felt like a festive event, the crowd was very happy and very loud as their team put up 10 runs on the way to a 10-1 easy victory over the D'backs. In the 4th inning, Corey Hart hit an inside-the-park three-run homerun and I high-fived my brother and people in front of me amidst the euphoric excitement. I've already written the story of the first Padres game I ever attended, a 15-12 loss to the Braves in July 2006. That night, with a 9-8 lead in the 9th inning, Petco Park seemed to briefly transform into a WWF wrestling arena and I wasn't sure if The Undertaker or Trevor Hoffman was entering the game. Loud, somber bells tolled and heavy rock-and-roll accompanied the arrival into the game of Hoffman, the San Diego Padres legend and holder of the all-time saves record. One out away from winning, he blew the game and the Braves took the lead. It was his second blown save of the year. He would finish the season with 5 blown saves but he also led the league with 46 successful saves and pitched so well that he finished second in the Cy Young award voting. After the Brewers game we spent the whole day seeing Milwaukee and then had a brief scare as a we got lost in the heavy evening fog off Lake Michigan and drove around the city for hours (our guiding light, a Garmin navigation system, was left at the hotel) trying to find our hotel before a couple of bearded college fellows we encountered tossing around a football in the street gave us directions. The next day we were to pack up again and head west through Wisconsin and Minnesota into South Dakota for the next leg of our trip. We woke up in the middle of the night to extremely loud thunder, frequent lightning and heavy rain at our window. The Weather Channel was in full emergency mode, explaining that there were heavy winds, lightning storms and tornadoes all over Wisconsin. The map they displayed had little computer-generated twisters all across our proposed path westward. We briefly argued whether or not to go ahead and drive west as planned but the pleas of the weather man---"STAY OFF THE ROADS"---won out. The storms cleared by the afternoon and we spent the day strolling the sidewalks, going to museums, sports bars, city parks. At one point we walked over a bridge underneath which a flowing river purled and pulled along big logs and forest debris. The cost-cutting Padres chose to let their 39-year-old franchise statue (on the team since 1993) Hoffman walk away after the 2008 season and he signed a one year contract to serve as the closer for the Milwaukee Brewers. With a high salary, declining effectiveness, and a maturing protege (Heath Bell) ready to inherit his job, the Padres' decision-makers determined that Hoffman was expendable. It was as though they were suggesting that he retire because few thought he would go on and continue his career somewhere else after being with the same team for 16 seasons. It felt like the Brewers had adopted another family's grandpa. He was a relic and he was leaving one of the coziest pitcher's parks in baseball. After putting together a surprisingly strong season finishing games for them though (by ERA+ it was his second best season ever), he was signed for another season. He recorded no outs and didn't appear to fool anyone with his pitches. As a whole, the Brewer pitching staff is off to a dreadful start. They've allowed the third most runs per game, 5.86 to be exact, ahead of only the Pirates and Diamondbacks. The starters aren't pitching deep into games and the bullpen hasn't performed when called upon, not just Trevor Hoffman, LaTroy Hawkins has also faltered in high-pressure situations. They don't look anything like contenders at this point despite an explosive offense. Can Rick Peterson right the ship? It's been reported that he has worked extensively with Hoffman recently to sharpen his pitching mechanics, explaining that Hoffman's "arm slot has gotten too high in his delivery, and that has contributed to a loss of movement on both his famed changeup and fastball." Even though he's 42 years old, I can't imagine the future Hall of Famer would lose his touch so suddenly after a what was really an excellent season at age 41. Fangraphs calculates how much each pitch has been worth in terms of runs and last year Hoffman's fastball and changeup were better than they've ever been in the years Fangraphs has kept tabs on it (since 2002). His velocity is the same and while he doesn't throw hard at all he was baffling hitters with the same stuff last year. I foresee Peterson's tune-up working for the beleaguered closer, although I hope the Brewers are patient enough to give him another chance. As desperate as they are right now for pitching help, they'd be insane not to. Their makeshift replacement so far has been Carlos Villanueva, a curveball-twirling righty swingman. This afternoon, in his second save attempt, he relinquished what was a hard-earned one-run lead (his team rallied for 5 runs in the 9th) against the Twins. The bullpen managed to stave off defeat for a little while longer but eventually lost when Joe Mauer scored on a sacrifice fly in the 12th inning. The Brewers have now lost 9 of their last 10 games. The starting rotation is a complete mess. Its two prize additions, Randy Wolf and Doug Davis both have ERAs over 5. So does Dave Bush and so does Chris Narveson. The only bright spot is Yovani Gallardo but he hasn't even averaged 6 innings per game in his starts before putting it into the hands of a shaky bullpen. It's on Rick Peterson's shoulders to uplift the minds and spirits of his charges using his psychological, Eastern philosophical approach. For some silly reason, I have faith in him. I'm rooting for these guys to climb back to life.